Your roof is one of the most important parts of your property, but it is also one area that homeowners frequently neglect. Over the last few years the UK has had some very harsh winters paired with some blustery springs too. Roof slates can easily become loose or damaged under such extreme conditions, and it is important to fix those problems before they become serious enough to damage your home. Many homeowners put off repairing their roofs because they are worried about the expense (of both labour and materials). The good news is that there are ways to keep the cost of roof repairs down by re-using or purchasing cheap roofing materials. Many old slates can be re-used or sold. High quality slates and tiles can last for a very long time. When you renovate your roof there is no need to throw out all of the old materials. Instead, try to re-use as many of the old materials as possible. Not only will this save you money, it will also give your roof an authentic, weathered look which may be particularly desirable if you live in a period property or a conservation area. If you live in a period property, take the opportunity to check your roof’s insulation while you are re-slating. Many period properties have either no, or very poor, insulation. Updating the insulation is a quick, easy and inexpensive job and one that could cut your heating bills by as much as 40 percent. Instead of importing cheap slates, or paying a fortune for brand new Welsh slate, why not buy reclaimed slate? Purchasing reclaimed materials is economical and can help to protect the environment too. One thing to bear in mind when buying reclaimed materials is that you cannot guarantee that all of the slate will be the right size or thickness. 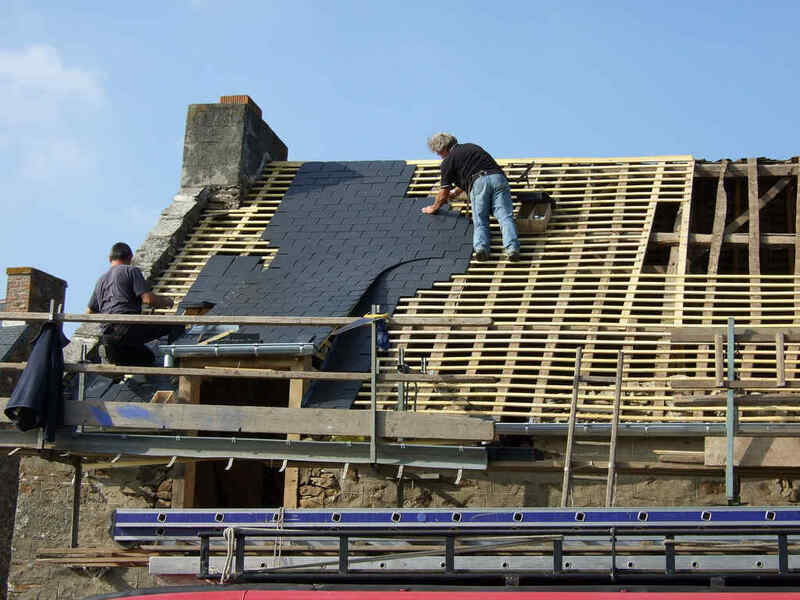 You should buy 10-15% more slate than you need, and spend some time sorting and re-cutting the slate to fit your roof. Even with this wastage, however, using reclaimed materials makes financial sense. Don’t try to get away with buying the bare minimum number of slates when using re-claimed materials. The appearance of slates can differ massively from batch to batch, even if they supposedly come from the same quarry. If you want your roof to have a fairly uniform, but naturally weathered, appearance then you should try to get all of your materials in one go. While Welsh slate has the best reputation when it comes to quality and appearance, you can acquire high quality slate from other sources too. Spanish and Chinese slate costs far less than Welsh slate, for example. The main problem with importing slate is that the quality can vary massively. 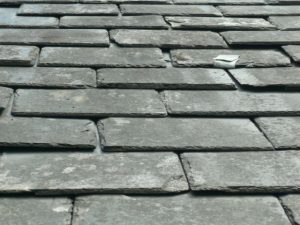 Low quality slate can peel and crack easily when exposed to harsh weather conditions, and will need replacing many years before slate from more prestigious British or Welsh quarries. Before you purchase a large amount of slate from a foreign country, request a sample, and inspect the certificate that comes with it. High quality slate should have a certificate that indicates that it has been tested to BS EN 123261:2004. Remember, however, that this is a minimum standard for frost and fireproof slate, and that it is not a sign that the slate will weather or age as well as Burlington, Westmorland or other prestigious UK slates. If you are trying to save money on roofing materials for a new build, why not try synthetic slates? Concrete slates are incredibly hardwearing, and still look nice. Fibre-cement slates have a consistent, neat appearance, are quite lightweight, and last a long time as well. The one downside to synthetic slates is that when they weather they do expose their base colour. New roof being installed on an older building. 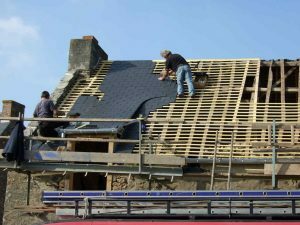 If you are on a tight budget and aren’t sure what kind of slate or tile to buy, it is a good idea to get in touch with a specialist roofing materials supplier. Not only will they be able to offer advice on the right kind of materials for your area, they will also have more expertise and purchasing power, so they can get you a good deal on the materials that you decide to go for. Buying the cheapest roofing supplies you can find, especially from an unknown supplier, is a false economy. By talking to the experts, you’ll get a better deal for your money, and some roofing materials that will last you many years. Once your new slate is installed, take the time to inspect the roof at least twice a year. Look for loose or corroded nails, slipped or missing slates and signs of leaks. If you notice any problems, get them fixed immediately to prevent expensive further damage. Next Next post: What is a breather membrane?